I spend a lot of my time meeting with people and talking about the current state of health care. Recently, there has been one notable element missing from these conversations: hope. To be sure, we live in divisive times, and our efforts to ensure our health care system works for all Coloradans, especially for those who’ve historically faced the biggest inequities, has been repeatedly at risk of being unwound for the last year. In the face of this contentious political environment, it’s hard to keep hope that our movement for health equity will prevail. This year’s Physician of the Year Award went to Dr. Kimberly Bentrott, a family medicine physician at Centura Health. Dr. Bentrott has worked hard to meet the health needs of those affected by inequities due to race, income, or ZIP code in Evergreen and Idaho Springs, through high-quality medical care and social supports. We presented two Non-Physician Provider of the Year Awards this year because both awardees were so amazing. Yumuriel Whitaker, a nurse at the Denver Metro Tuberculosis Clinic at Denver Public Health, received the first for her compassionate, high-quality care for those suffering from this stigmatized disease and for her community leadership as part of the Mile High Black Nurses Association. Sue Covington, a physician assistant and clinic director at Doctors Care, received the other Non-Physician Provider of the Year Award for her exceptional commitment to improving care delivery, integrating medical and dental care, and supporting telemedicine, especially for patients who have complex needs. Our Advocate of the Year Award went to Ross Brooks, CEO of Mountain Family Health Centers in the Roaring Fork Valley. Ross is a tireless champion for health equity and access to high-quality, patient-centered, integrated health care for all Coloradans. As a leading champion for rural and mountain communities, he is driven by the simple principle that access to health care is a human right. 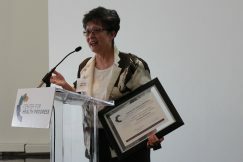 Christine Wanifuchi, recently retired, longtime CEO of Asian Pacific Development Center, was awarded our Dr. Gary VanderArk Lifetime Achievement Award. Christine’s leadership on increasing access to health care and social services for Colorado’s immigrants and refugees has been recognized for years. As a volunteer on countless boards, task forces, and councils, she is still at work helping to create a health care system that works for everyone. We’ve been handing out our Community Champion Awards since Center for Health Progress’s early days, and have barely scratched the surface of the many deserving leaders around the state. We’d like to thank this year’s winners, and all of the nominees, for inspiring hope when we needed a little reminder of all the good that is being accomplished.